RAdm Craig Baines, Commander MARLANT and JTFA, was on the ice for the ceremonial puck drop, along with 12 Wing OSS CO LCol William Reyno, at the 15th annual Halifax Mooseheads DND Appreciation Night on November 9. The Halifax Mooseheads hadn’t earned a victory on DND Appreciation Night in five years heading into their November 9 meeting with the Cape Breton Screaming Eagles, but were able to break that losing streak in front of a crowd of 8,540 that included many members of the defence community. The Mooseheads took down the Screaming Eagles 5-2 on a night that was all about supporting men and women in uniform and honouring some of this year’s military milestones. Once again, the Mooseheads wore special DND-inspired jerseys for the game, with the latest design honouring the 100th Anniversary of 12 Wing Shearwater. Raffle tickets were sold throughout the night for a chance to win one of the special jerseys. “Over the years, the Mooseheads, along with the fans, have raised close to $170,000 all in support of the Camp Hill Veterans’ Memorial Garden. It’s something that’s very important for the team each year,” said MooseTV announcer Scott MacIntosh prior to the game. With sales from this year’s raffle tickets, along with more jerseys that will be auctioned off at a later date, the total amount raised through this 15-year partnership will be approaching $200,000. The money goes entirely toward the Memorial Garden, which is one of the most popular recreation areas for the more than 175 veterans who call the Camp Hill facility home. 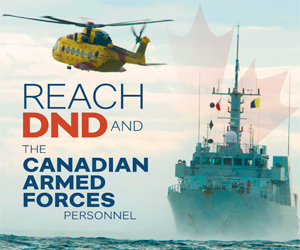 A number of CAF members, serving and retired, volunteered to sell the raffle tickets at the game, while others enjoyed a night out in the crowd, with reduced ticket prices for those in uniform as well as DND civilians. 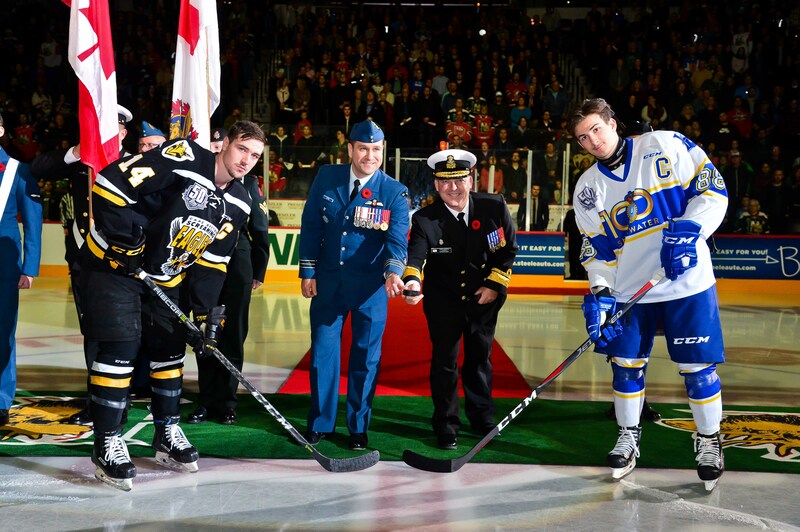 RAdm Craig Baines, Commander MARLANT and JTFA, performed the ceremonial puck drop, accompanied by the MARLANT Flag Party along with 12 Wing OSS Commanding Officer LCol William Reyno. “I just want to say how much we all appreciate the Mooseheads organization for this special event each year recognizing our men and women in uniform. 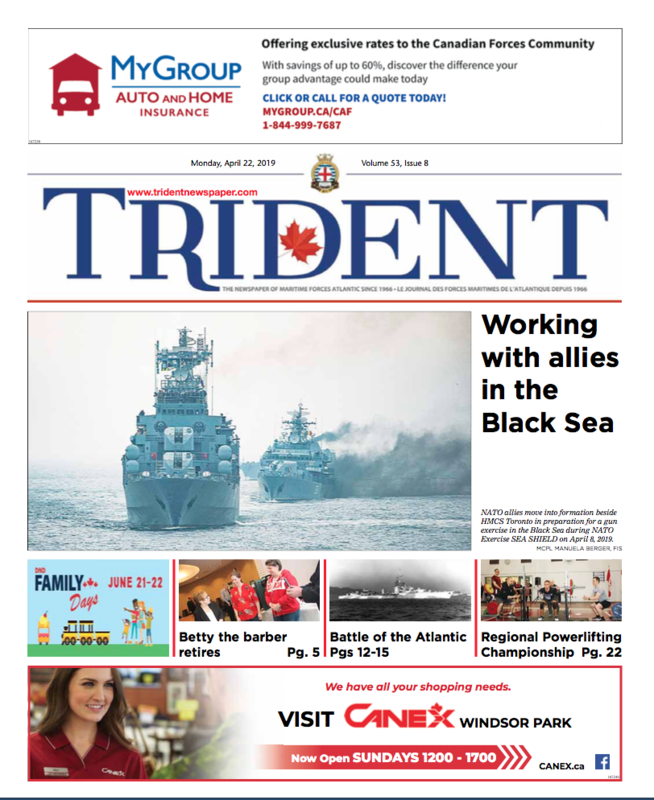 It’s something we always look forward to,” RAdm Baines said. He added his thanks to the fans for always filling the arena and raising thousands of dollars for Camp Hill, and to the HRM community at large for always being supportive of the large Armed Forces presence in the region. With the game falling two days before Remembrance Day and the marking of 100 years since the Armistice and end of the First World War, RAdm Baines also expressed the importance of honouring those who served in the past, from the soldiers of the First World War, to those who now reside at Camp Hill, to the many veterans who were in the crowd at the Scotiabank Centre. The crowd agreed with thunderous applause. On the ice, the Mooseheads got things going early with a pair of goals in the first from Raphael Lavoie at the 6:04 mark and from Samuel Asselin in the final 30 seconds of the period. Cape Breton got one back in the second period, and netted a second goal early in the third, but Halifax kept the lead and the momentum throughout. Ben Higgins scored the Mooseheads’ third at the 18:05 mark of the second period, while Walter Flower and Arnaud Durandeau each scored in the third to make the 5-2 final score. Ben Higgins named first star of the game for his game-winning goal in the second, while Samuel Asselin was named second star and Cape Breton’s Declan Smith got the third star. The win put Halifax at a record of 15-4 for the season.